These low carb donut bites are an ideal treat for the fall; you’ll love the apple and cinnamon flavors! Sugar free, gluten free and keto recipe. I am SO excited to share this new book with you: Everyday Ketogenic Kitchen, written by Carolyn Ketchum of All Day I Dream About Food fame! The book contains over 350 pages of low carb fabulousness, with gorgeous photos, clear directions, and even a really cool pictorial index! Although hailed as the The Low Carb Baking Queen, Carolyn has excellent skills in all areas of low carb cooking. I’ve followed her blog for a long time – and I clearly remember making her Nanaimo Bar Tart in 2014 before I even started this blog! The book includes recipes for breads, appetizers, entrees, soups, sides, desserts and much more, as well as a guide to sweeteners, pantry ingredients and useful substitutions. With permission of the author and publisher, I would really love to share one of the recipes with you guys – just to give you a taste of the recipes in the book. There were MANY to choose from, but Apple Cider Donut Bites really stood out for me. Not only have I never attempted to make a low carb donut, but I have also not featured any recipes on this blog that contain apple. I couldn’t wait to get started. I followed the instructions absolutely – although I did halve the recipe. I knew I would be the only one in the house that would be eating them – and I didn’t want to be tempted into eating too many. The recipe was easy to halve – and the donut bites were perfect. I mixed together almond flour, sweetener (erythritol is recommended), whey protein powder, baking powder, ground cinnamon, and salt. Then I whisked in an egg, water, melted butter, apple cider vinegar, and apple extract. The last ingredient was the only tricky one, and Carolyn even makes a note that she buys it online. One quick search on Amazon – and there were a lot of choices! I went with Apple Flavor Baking Oil. It’s highly concentrated so I guessed at the amount: half of one of these little vials was perfect for my half batch of the recipe from the book. I spooned the batter into a greased mini-muffin pan, and baked in a preheated oven for about 17 minutes. I let them cool slightly, then transferred to a wire rack. I dipped each low carb donut bite into melted butter, then into a mixture of sweetener and cinnamon. 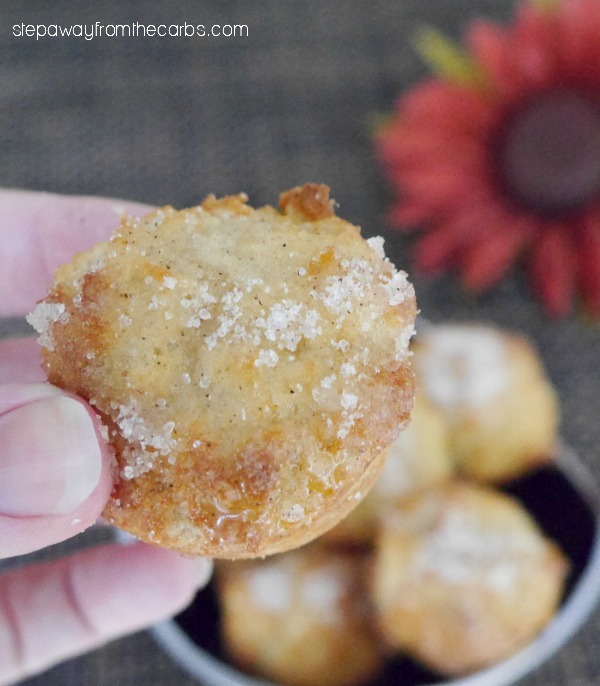 They tasted SO good – and the perfect low carb treat for the fall! The nutritional data given in the book is as follows (per serving of 2 bites): Calories 164, Fat 13.7g, Protein 6.5g, Carbs 4.8g, Fiber 2.2g, Erythritol 15g. 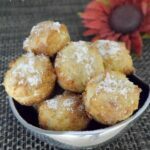 In the recipe below I have given my halved quantities, but it is easy to double if you want 24 low carb donut bites! 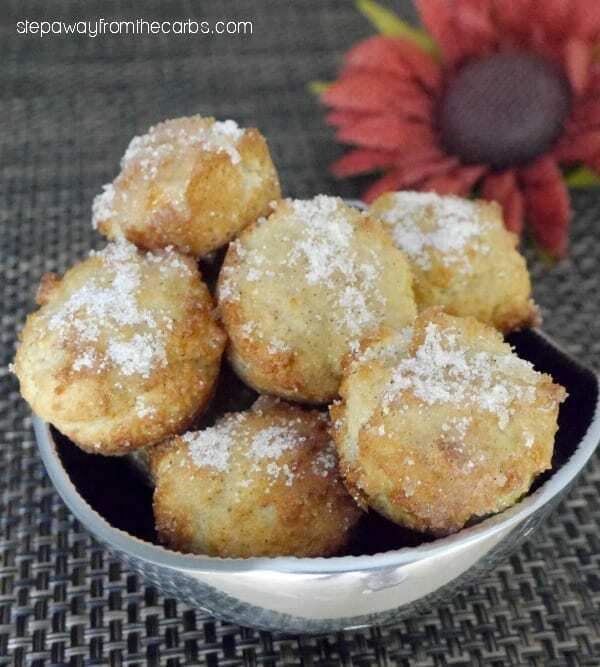 These low carb donut bites are an ideal treat for the fall; you'll love the apple and cinnamon flavors! 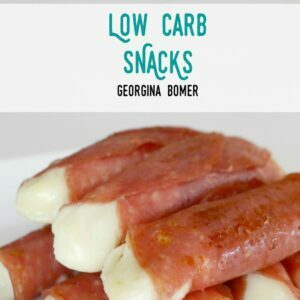 Sugar free, gluten free and keto recipe. Mix together the almond flour, sweetener, protein powder, baking powder, ground cinnamon, and salt. Whisk in the egg, water, melted butter, apple cider vinegar, and apple extract. Spoon the batter into 12 holes of a greased mini-muffin pan, and bake for 15-20 minutes. Let them cool for 10 minutes, then transfer to a wire rack. To make the coating, mix together the sweetener and cinnamon on a plate. Dip each donut bite into the melted butter, then into the mixture of sweetener and cinnamon. Don’t forget to grab your copy of Everyday Ketogenic Kitchen! Thank you so much, my friend and I look forward to hanging out with you in Chicago! Sharing this on Facebook and Pinterest. What can I use in place of the apple extract? I’m afraid extracts are the only way I know of to add the apple flavoring without the carbs. Sorry! They could be just cinnamon doughnuts? – I love cinnamon, so I’m going to give them a try! These look promising. Has anyone made them? How are they? Thanks for sharing! I just made these and they came out wonderfully. I had to make a few substitutions – I didn’t have any apple cider vinegar, so I used regular distilled vinegar, and I didn’t have apple extract, so I used vanilla extract. The result far surpassed my expectations, and comes remarkably close to the taste and texture of a legit donut. I know I would h e to change the amount of flour but could coconut flour be used instead if someone is allergic to almonds? As I didn’t develop the recipe it’s hard for me to say – as I haven’t tried it with coconut flour. You might need to add an extra egg because coconut flour is more absorbent than almond flour and will make the end result drier. 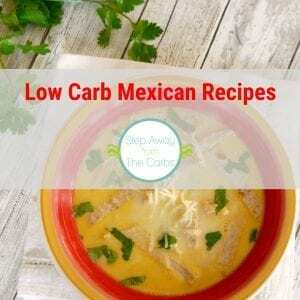 Approximately how many carbs per recipe? Why whey protein powder? I have all ingredients but that one and really want to make these right now. Love Carolyn Ketchum…I have this book and pre-purchased her others…I have been following her for years and love her recipes, thanks! Would love to make these…how many makes a serving? This recipe makes 12 bites, and they are 2g net carb per donut bite.